Tuesday’s Tundra & Taiga: Do you feel lucky? Well, do you? Abandon all hope of getting rescued, ye who enter here…..
Two sets of these signs, this one and on the other side of the road, go up here in Paxson each October. A matching set appears at the other end of the Denali Highway, in Cantwell. The last winter fatalities on our road occurred over a dozen years ago as the culmination of a series of Very Bad Decisions. Three crosses at mile 43 remind travelers that There But For the Retention of a Few Still-Synapsing Brain Cells Go I. 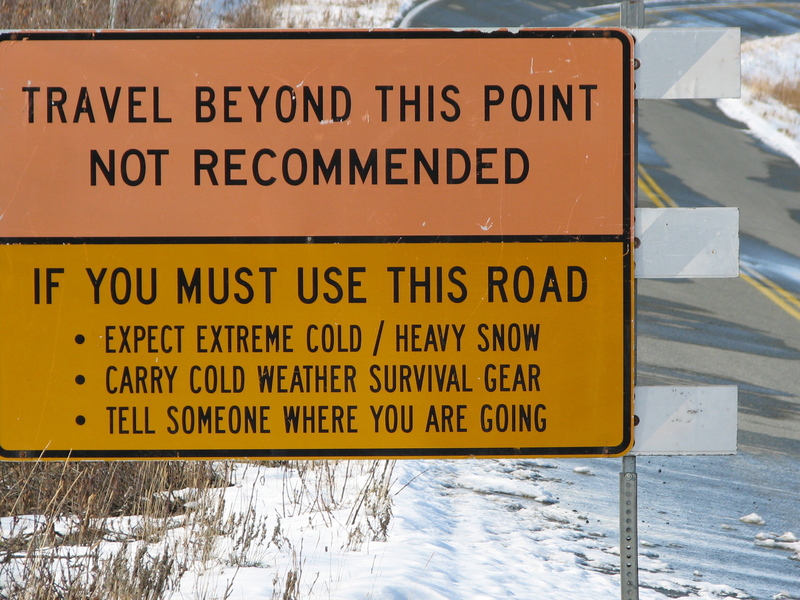 There are a number of circumstances that make the possibility of big problems on our road even more precarious this winter. First is the altered hunting regulations, which are encouraging significantly more caribou-seekers here than has been the case for decades. Second is that those mile-42 stalwarts, Alan and Susie Echols of Maclaren River Lodge, have folded their tents and gone to balmier climes….like Fairbanks….until at least the beginning of February. Alan has been responsible for many, many rescues over the past decade – AK State Troopers have been more than happy to pass on to him the burden of rescues. Not that anyone already reading this blog often needs to look at our website – usually, it’s website readers who learn of the blog, thus the flow proceeds in that direction – but today’s post is mostly to state that our venerable site, looking for the most part as it has for about ten years, is in the shop for a complete frame-off rebuild. NEW, however, is that the extant site is, momentarily, gone from view. It will be back! With any luck, that will be before you’re even reading this post. Thus, long before the new site is active, the old site will act as seat-warmer. Side-tracked Saturday is an occasional. A bon mot, or something shiny that caught this magpie’s eye. Foodie Friday: At -24º, Summer’s Over! 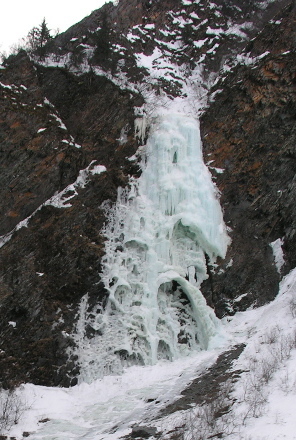 Some wintry weather descended upon the upper Gulkana valley this week. Yesterday’s dawn low was -24ºF/-31ºC, and the mid-day high -10º . We’re – almost – ready for the cold, and the dark, and the slow business we’ll be enduring the next months. *Feel free to use dashes and splashes in lieu of the amounts listed. After all…that is what I do. The strict numbers below are just a guideline, yaaaarrrrrrrrrrrrrrhhh. I used to have a large tea ball into which I could confine the spices; that makes it easier to remove them after steeping. The tea ball long ago fell apart; I now dump everything in and use a sieve once steeping has finished. Steep for about fifteen minutes, slowly bringing the concoction up to a hot drinking temperature. The spices are not too overpowering if you allow them to remain in cooled brew overnight if you have any remaining, but you don’t want to keep them hot for much more than 20-25 minutes or bitterness may result. *1/4 c /25 ml orange liquer. Triple sec is fine: again, save the Cointreau or Grand Marnier for a more delicate quaff! Find a loved one and two glasses, and – who said anything about winter? Even non-birders have at least a passing knowledge of woodpeckers – except perhaps those living in Australasia or Madagascar, where this order is absent. Even there, the presence of Woody Woodpecker likely has made its mark. And of the 179 or so species worldwide of woodpeckers, all but a handful – perhaps a half-dozen – bear, amongst at least the males, diagnostic red on the head: a cap or crest, a mustache mark, a gular stripe. In North America, it is only the two species of three-toed woodpeckers – aptly named in contradistinction to the four toes other members of the order possess – who sport no red. Rather, the males wear a yellow crown. 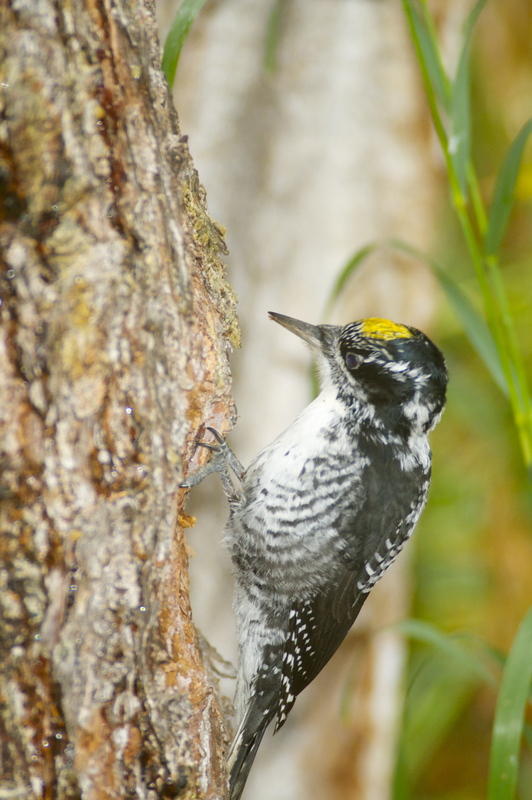 Alaska is home to both the black-backed and the northern three-toed woodpeckers. The former is more often seen than the latter in eastern North America; in Alaska it is closely associated with outbreaks of spruce budworm and with forest fires, usually becoming locally very common some three to five years after a conflagration. 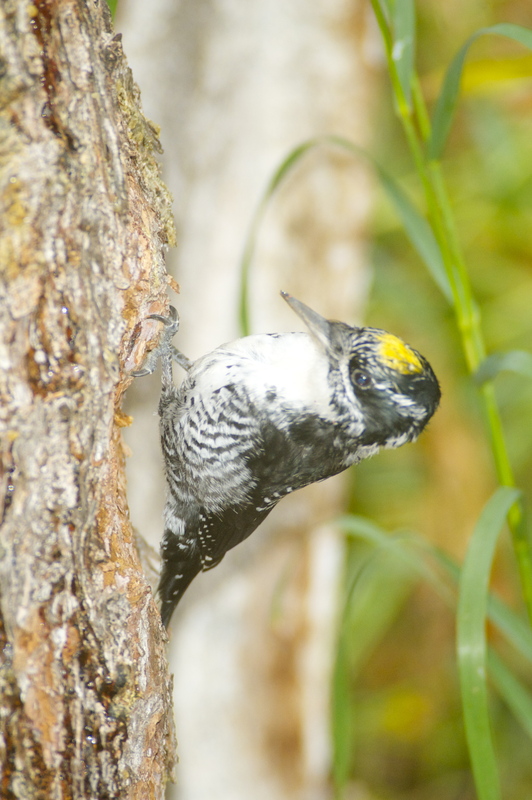 The northern three-toed (at present, also called simply “three-toed woodpecker”) is more general in its occurrence throughout Alaska’s taiga. Fortunately for the photographer, this bird is not overly shy. It seems to have a preference for the lowermost sections of a spruce, which allow for gratifying shots from above and often sparing the photographer the stiff neck that often accompanies bird photography. Rarely is the woodpecker common, though, and it was with great pleasure for me that the male depicted here stayed around the large spruce adjacent to our house’s deck for some weeks late this autumn. Yep: three toes on this guy! A characteristic behavior of this bird is that it is one species I have learned to be able to identify by sound. That is, NOT by call or song, but by the diagnostic noise created by its gleaning. Rather than the drilling, often in staccato fashion, which is so prevalent amongst most other woodpeckers, the three-toed typically scrapes, or flakes, pieces of bark off spruces in its quest for beetles and their larvae. One would not be amiss in calling both species three-toed woodflakers rather than woodpeckers.